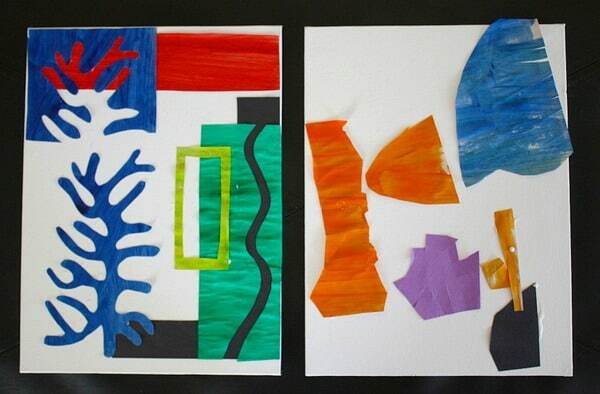 Here are two fun art projects for kids inspired by Henri Matisse. 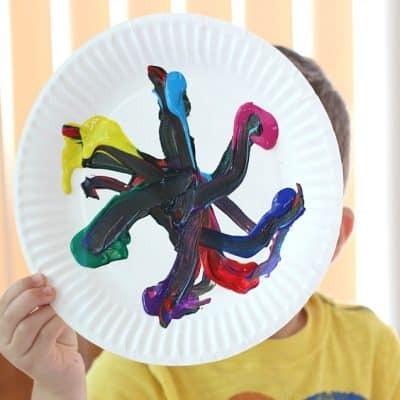 In one Matisse-inspired art lesson, children use magnets to create art that can be moved around and changed. 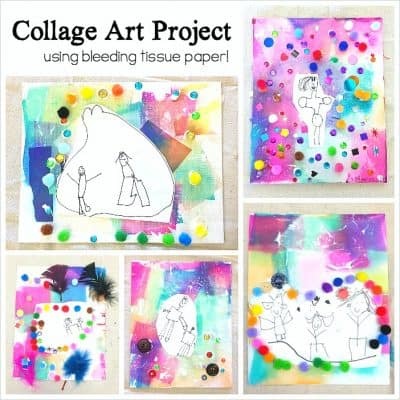 In the second art project children use scissors and colored paper to create an art collage of shapes on canvas. Recently Lucy and I headed to our local art museum looking for inspiration for our next art project. 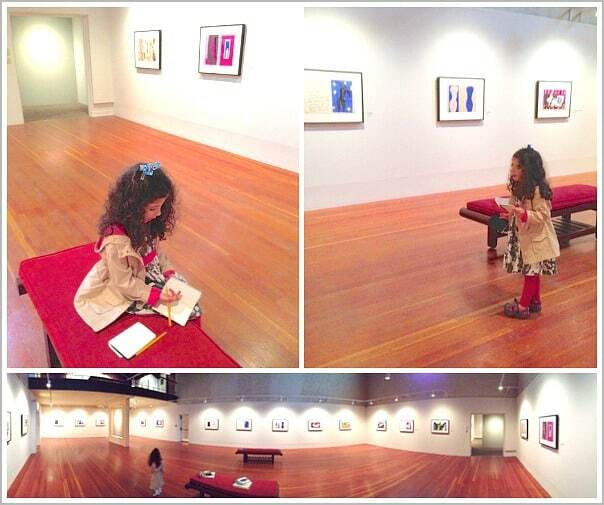 Luckily, they had a Henri Matisse exhibit going on that Lucy was immediately drawn to! We walked around the large gallery taking photographs and commenting on each piece of artwork with Lucy unable to resist making a few echoing sounds in the large room. (Admittedly, it was a great room for making echoes.) Then we sat on the benches in the center of the gallery. Lucy got out her sketchbook, while I browsed the Matisse books the museum had made available. 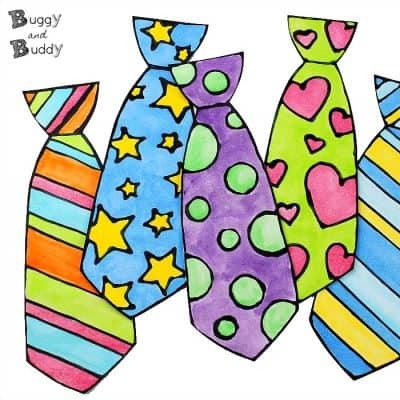 Lucy began by drawing shapes from her favorite pieces. She loved writing the titles by them as well. Later, she came up with a game. We were to each secretly draw shapes from the one piece of Matisse’s artwork. Then, we had to look at each other’s and try to guess which piece the inspiration came from. We did that for quite a while! Later, we went downstairs and were pleasantly surprised to find a very inviting area set up for making art from paper cut outs just like Matisse did. The wall was painted with magnetic paint (which I have yet to try myself, but am dying to) and had magnets placed randomly around the wall. On the wall we found designs and shapes from previous visitors. Wouldn’t this make a great creative center in a classroom? In place of a magnetic wall you could use magnetic cookie sheets or magnetic galvanized sheet metal. After releasing some energy, we headed off to have lunch together, talking about ideas we had for our art project. Once we got home, we read some more about Henry Matisse online, mostly about how and why he created his artwork from cut outs. We learned he had become ill and painting was more difficult for him so he decided to substitute scissors for paint. 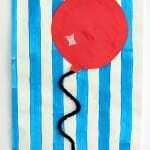 He would use scissors to cut large and interesting shapes from painted paper. He called this “drawing with scissors.” He would usually cut the shapes out freehand and save both the piece he had cut out and the remaining paper. He would then use those pieces to create art by arranging and rearranging them on his studio wall. Once he was satisfied with his creation, the collage of cut paper would be permanently glued down to some type of canvas or paper. We also stumbled across this old video on youtube of Matisse making some paper cut outs. After seeing his artwork and learning more about him, we were finally ready to get started making our own artwork inspired by Matisse! 1. We decided to start by making our own painted paper. (This is completely optional. You could just skip this step and use colored construction paper). We got out some white sheets of paper, paint and brushes. 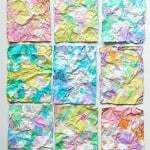 Then we began mixing paints until we found colors we liked and then painted the sheets of paper, letting them dry overnight. 2. The next day we looked at some of the photographs we had taken at the museum. We noticed the bold colors Matisse used and described the shapes we saw. 3. 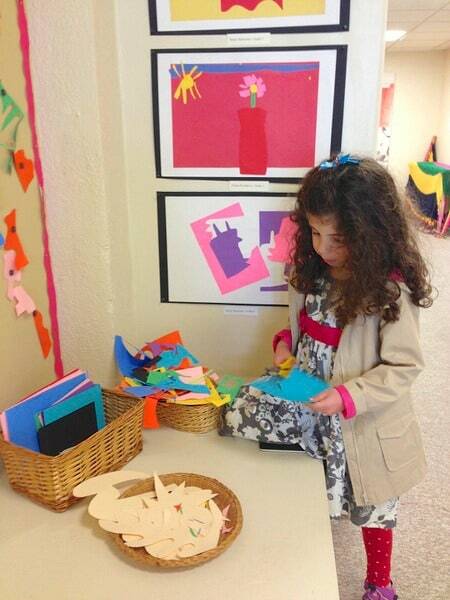 Then we got our dry, painted paper, various colors of construction paper and scissors. 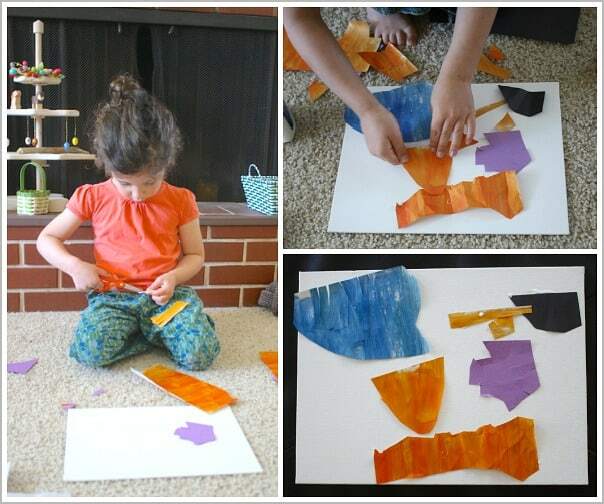 We each chose some colored paper to use and got busy cutting various shapes. I loved listening to Lucy as she cut out shapes! 5. Then, we glued each piece into place on our blank canvas to complete our masterpieces! 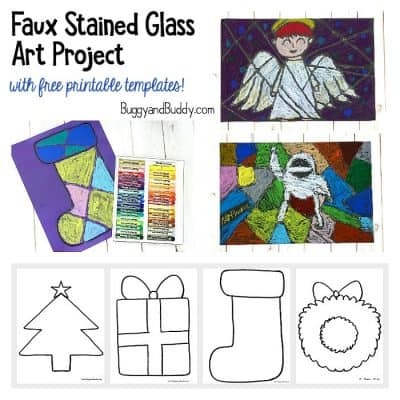 This project would also be fun to do together in a classroom. 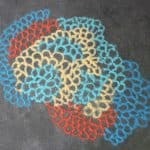 I can imagine the kids sharing and discussing their shapes and designs as they are creating! Priceless! Your daughter is so talented, and fortunate to have a mom who gives her such great opportunities. And the video is a treasure. What a find! Thank you so very much, Susan! It was such a memorable day! One of my favorite things about the day was she was so excited that she planned her most special outfit she could think of~ her Christmas dress, valentine leggings, Dr. Seuss hair bow, light-up shoes and her “detective jacket”. Thanks, Jessica. It was just such a fun day! I loved hearing all the comments and reactions Lucy had to the artwork. Definitely a special memory! How wonderful that you got to see his work in real life! 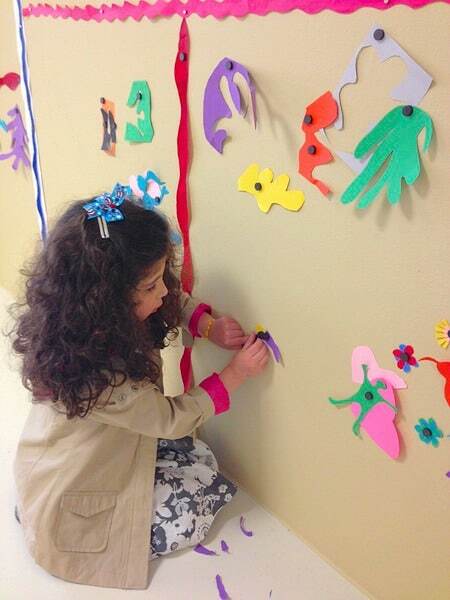 I would have loved to have taken a trip when we did our Matisse art. Nothing beats seeing the real thing. 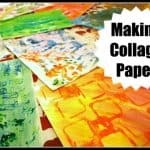 I like that you used both colored paper and paper that you painted as well – lots of texture. 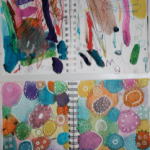 Thanks for sharing on Kids Get Arty. 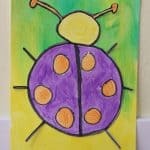 What a great way to get kids into art. And it looks like your daughter really enjoyed it and had fun with this. Thank you so much for sharing on We Made That! What a great post! I love the virtual art museum visit. Pinning it. 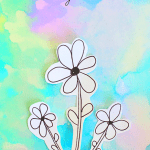 Stopping by from the Mom’s Library Blog Hop. Thank you for pinning! Lucy says she is taking her Daddy there next~ she had so much fun! Awesome! 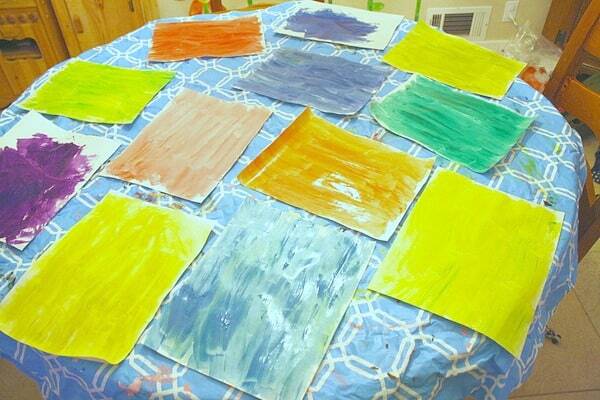 I love how this was a multi-step project to really reinforce Matisse in her head. Her finished piece is lovely! Thank you, Jeanette. She was so proud and still talks about our special day. She wants to take Daddy there next! This is one of the best art lessons I have seen in a long time. Great inspiration and I love your daughter’s words – that she is an artist. And a wonderful lesson on a master artist. I had a lovely time walking with you through your day. Thank you so much, Janis! It really was a wonderful and memorable day~ definitely inspired to do it more often! Beautiful!! Such a wonderful experience. Thank you for sharing at Sharing Saturday! Hello! What a fun day and beautiful artwork! We decided to feature you post on Share It Saturday tomorrow. We will also share with our FB, Pinterest, and Twitter followers. 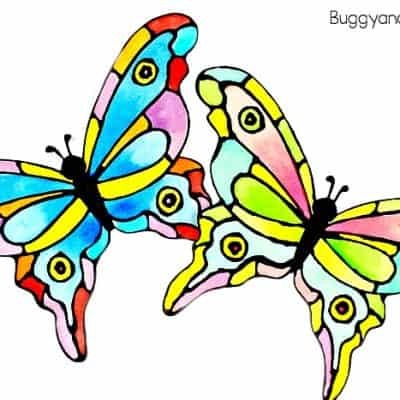 Here are the links to those pages if you would like to stop by. We love your ideas and hope to see you again at Share It Saturday! 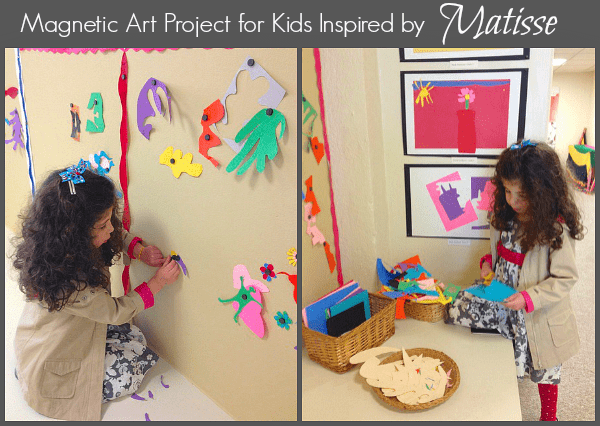 Thank you so much for featuring our Matisse post! I love how you went to the art museum to find inspiration. The entire study is terrific. 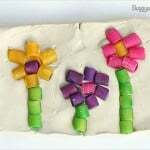 Can’t wait to do some similar activities with my little ones. Thanks for sharing this post at Discover and Explore. Excited to see what you share for our Zoos and Wild Animals theme this week.